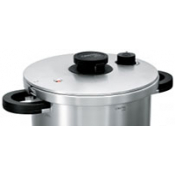 The Fixed Strate pasta cooker is made of 18/10 stainless steel and has high-sided heat-diffusing base. The walls and the bottom are made of 2 layers of stainless steel, and an aluminum layer between them. Solid, fixed handles, welded.Thanks to the aluminum layer, an ideal heat distribution occurs th.. Attractive and developed with the use of the latest technology, the Fixes Mercure series features a glossy surface and clarity of lines. The collection of cookware with fixed handles fits perfectly into the concept of modern cuisine: ideal internal polishing, cast edge and thick three-layered bottom..
Alto Pressure cooker will be an indispensable assistant for lovers of delicious and healthy food. Its design is simple and convenient. Reliable handles do not heat up, and a comfortable lid, manufactured using a unique patented technology, can easily be opened and closed with one hand. Turning the s..
Set (steamer + tall saucepan + cover Platine + 2 handles pink color). The material (steel 18/10) provides increased strength and a long service life of the product. On the other hand, it guarantees ecological safety and hygiene of the cooking process. 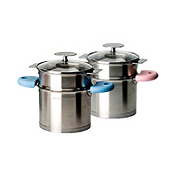 The set is ideal for small children's food prepa..
Set (steamer + tall saucepan + Platine lid + 2 blue handles). The material (steel 18/10) provides increased strength and a long service life of the product. On the other hand, it guarantees ecological safety and hygiene of the cooking process. The set is ideal for small children's food preparation. .. 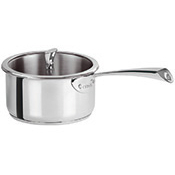 Pasta Cooking Insert CRISTEL, Casteline, 24 cm. Pasta cooking insert Cristel ECP24CC is a combination of functionality, elegant design and convenience that will bring you the joy of cooking. Durable, environmentally friendly and safe materials guarantee you safe use, so you will see the true value of this wonderful kitchen item.Insert allows you ..
Steamer CRISTEL, Casteline, universal, classic shiny 24 cm. 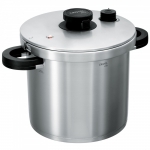 Steam cooking insert Cristel CVU24CM is a combination of functionality, elegant design and convenience that will bring you the joy of cooking. 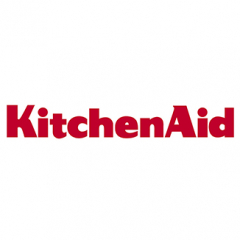 Durable, environmentally friendly and safe materials guarantee you safe use, so you will see the true value of this wonderful kitchen item."".. 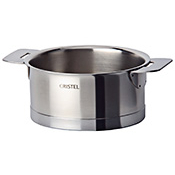 Universal stainless steam cooking insert CRISTEL, Fixed Strate, 24 cm. 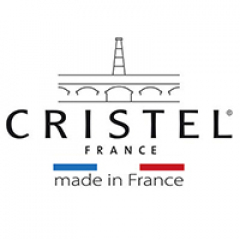 Steam cooking insert Cristel CVU24SF is a combination of functionality, elegant design and convenience that will bring you the joy of cooking. 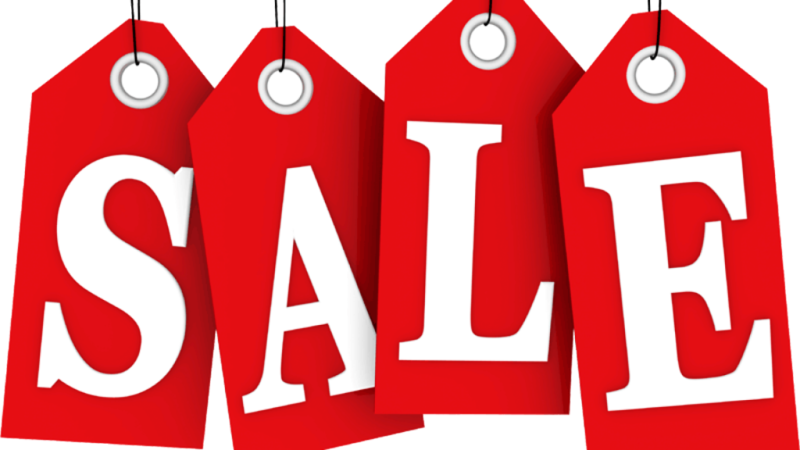 Durable, environmentally friendly and safe materials guarantee you safe use, so you will see the true value of this wonderful kitchen item."".. Bain-marie insert CRISTEL, Casteline, classic, shiny, 20 cm. Use this cooking insert when you want to slowly heat a tender sauce or melt the chocolate without sticking. This stainless steel insert is a must for preparing classic egg sauces in order to provide slow, gentle heat to make the texture of the sauce smooth and silky. 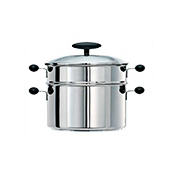 ""..
Steamer CRISTEL, Casteline, universal, classic shiny 20 cm. 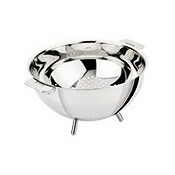 The steamer is made of stainless steel 18/10, mirror polished. Solid, removable handles with a stainless steel mechanism. You only need to press the button to remove them. 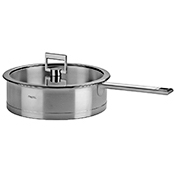 There are holes on both sides of the body, designed for attaching removable handles of various sizes, you can buy them additiona..
Universal stainless steam cooking insert CRISTEL, Fixed Strate, 20 cm. Steam cooking insert Cristel CVU20SF is a combination of functionality, elegant design and convenience that will bring you the joy of cooking. Durable, environmentally friendly and safe materials guarantee you safe use, so you will see the true value of this wonderful kitchen item. ""..